I got all the bits and pieces successfully removed and baggied up. Nothing left to do but pull the engine (well, and the wheels and swing arm). I have no idea how one normally removes an engine, but I doubt this is the propper way. I layed the bike on its side and removed all the bolts and voila! Most of the pieces below will never end up back on the bike but having spares and or options is always a good thing. 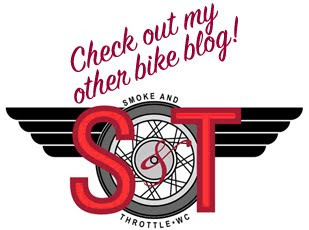 A rookie mistake (for a rookie bike builder:) never use the blunt end of a drill bit to try to tap-out the stuck piston through the spark plug hole. The bike has been cleared of all bee's (I hope), so next up is the electrical system. I opened up the headlight and found a rats nest of wires. Fortunately all were color coded and appeared to be un touched by unskilled hands. Despite the color codes (each and every wire has a different color and stripe combo, which coincides with the Haynes manual I purchased on ebay) I decided it was best to label and photograph everything if I am ever going to get this rewired. I pulled the handlebars tac and speedometer off, I removed the battery box and air filter - not sure if any of this will end up on the final product. Oh, did I mention what my plans are for this bike? I plan on building a mini cafe-racer. Somewhere in the near future, I'd like to build a british cafe-bike, but I need to do a practice run on something more affordable. Hence, the cb125. Odd choice for a cafe bike you say? Well do a search on cb125 cafe bike and you may see some that look like this one or one of these. Yup all cb125's. Once the air filter had been removed I popped off the carb and had a look. Ouch, not so good! The white crud in the picture below is the result of 20 year old gasoline. I let them soak in carb cleaner over night though the next day I was still unable to get the parts moving with out chipping internal parts so I ordered a new aftermarket carb from ebay. I've been wanting to rebuild a trashed motorcycle for sometime, just to check it off the list of "things I must do in my lifetime". I have a couple of bikes (all of which I acquired for free over the years (2 bikes from family members and one incredibly great barn find). Anyway, the bikes I have all run well and since I really don't know what I'm doing, I just can't bring myself to dismantling something that works fine... at least for now. This project had to be something that had parts easily available and small enough that I wouldn't get in over my head. 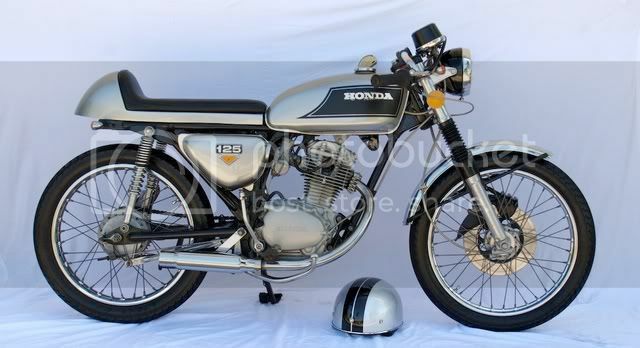 After a few weeks of scouring ebay and craigslist, I found a 1974 Honda CB125 for $200 WITH A TITLE! The engine was described as "stuck" and the rest of the bike was "as is". Perfect little project for me and my new garage. I picked up the bike from Ben Salem PA and was pleased at how complete the bike appeared to be. While a lot of parts would have to be fixed or replaced, at least I know what goes where. I got home and immediately started tearing into the bike, photographing every step so I'd have a record of what went where. All small parts were placed into ziplock bags with labels. Under the tank I discovered an old wasp nest. Nice! Imagine if there had been wasps in my van when I drove home? A couple minutes later I was taking off the tail light and low and behold, another wasp nest! When I went to pull it off I was shocked to be face to face with a live bee. Whoa, I had driven and hour with these bees in my truck - windows up with AC on!. At this point I grabbed a hose and bathed the bike from a safe distance and called it a day.